Both in the UK and Ireland summer has arrived at last. Unfortunately for hay fever sufferers summer it is a mixed blessing. 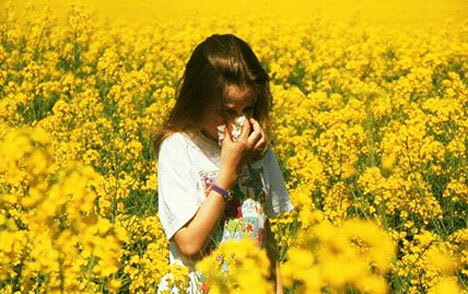 Go to the Hay Fever Program for more information and how to buy the remedies. Another advantage of using homeopathic remedies for hay fever is that unlike medical drugs for hay fever that don’t make you feel drowsy. This is very important if you are using any kind of machinery – driving a tractor is an example. Contains Aralia racemosa (American Spikenard), Cardiospermum halicacabum (Heartseed), Galphimia glauca (Golden Thryallis), Luffa operculata (Luffa), Larrea mexicana (Chapparal), Okoubaka aubre villei (Okoubaka) and Ammi visnaga (Toothpick Weed). Interestingly all seven of them are tropical plants. At first that may seem strange but perhaps it is for when we are experiencing tropical weather – I wish. I have recently added Elder flowers (Sambucus nigra) and Ragwort (Senecio jacobaea) to The Treat Acute Hay Fever (Plant) Formula because they also cause hay fever symptoms in some sufferers. It should make The Treat Acute Hay Fever (Plant) Formula even more effective.